We’re back! 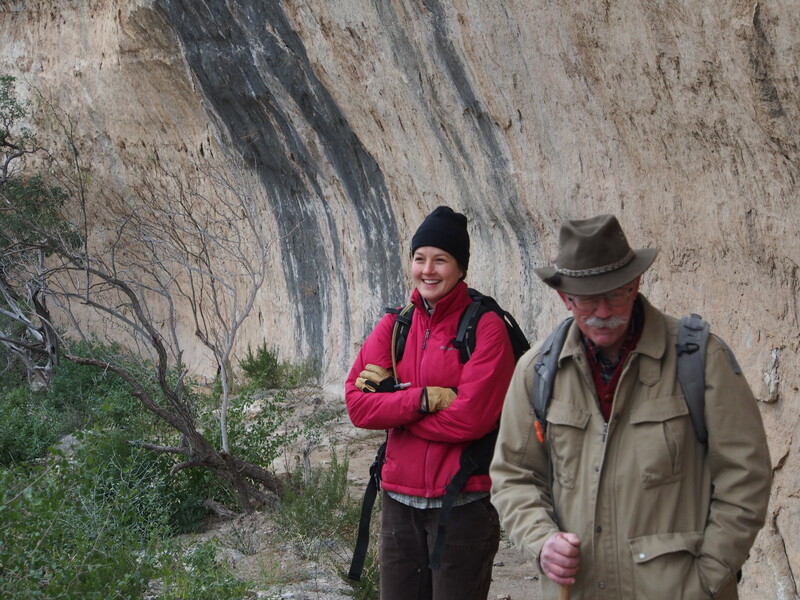 Today marks the first work day of the 2015 Eagle Nest Canyon Expedition. We are very excited to be back, and are looking forward to another fantastic field season. Unfortunately, Steve will not be spending as much time in the Canyon this spring as he would like, but he has left me (Charles) to run the project in his place. I am joined once again by Bryan Heisinger, one of the interns from last spring. Bryan returns to the ASWT project after spending another summer in the Sierra National Forest, and will be serving as Staff Archaeologist for the duration of the spring. Along with Bryan and myself, we are fortunate to be joined by three outstanding interns: Matt Larsen, Victoria Pagano, and Emily McCuistion. I was born in Austin, TX and there I remained (for the most part) until graduating with a BA in Anthropology from the University of Texas. Since then I have followed archeology work to some remarkable places including Death Valley National Park, where I fell in love with the desert, and Denali, Alaska. Most of my archeology experience has been with the National Park Service and US Forest Service doing survey, site recording and condition assessments, and aiding in management decisions pertaining to cultural sites. I also worked in NSW, Australia consulting for development projects, briefly worked on a nautical excavation of a Civil War gunboat off the Texas coast, and detailed on the BP oil spill clean-up at Gulf Islands National Seashore. I am now pleasantly surprised at my good fortune as to be doing archeology where I have longed to be, in southwest Texas, and with a team that is so innovatively balancing preservation and data retrieval. I am excited to learn from and contribute to our knowledge of history and landscape of the striking and enigmatic Lower Pecos Canyonlands. I graduated from UTSA in 2014 with my B.A. in Anthropology. My sole archaeological experience was a month long field school in central western Belize as part of the MVAP/MVPP project headed by Dr. Jason Yaeger and Dr. Kat Brown, where I worked at Buenavista del Cayo. In 2011, I worked as an Interpretation Intern at Petrified Forest National Park; I guided and informed park guests on all aspects of the park: archaeological, historical, geological, and paleontological. My experience at the park has placed conservation and stewardship as a priority in my work and goals, which I am glad to find are important aspects to this project. I spent Fall 2014 in UTSA’s GIS certificate program learning some GIS and remote sensing. I focused my work in the program on wildfire effects on vegetation and wildfire patterns in Arizona. As part of this ENC team I look forward most to working in project that is aimed towards bringing archaeological records into the future with new techniques and standards. I am excited to learn more about the Structure from Motion software and explore the field of geoarchaeology. My name is Matt Larsen, though I usually go by Larsen because there are always at least 2 other Matts in any large enough group. I graduated with a degree in German from UT-Austin in 2008 and put that to good use by working at Pete’s Piano Bar in Austin for 6 years or so. In 2012 I decided to follow a life-long dream and become an archaeologist. I attended Texas State and received my second B.A. in Anthropology in December of 2014. While at Texas State I interned with the curation lab at the THC’s Historic Sites Division’s repository in Austin. While there I spent my time processing the archaeological materials from Fort Griffin State Historic Site. I also worked as an undergraduate intern for the final quarter of the 2014 ENC field expedition. I learned quite a lot in that 6 weeks and made some good friends. I enjoyed backfilling excavation units so much I decided to quit my job and join the 2015 ENC field expedition for the full duration. I am excited to get back out there and get really, really dirty again. The LPC is a very special place due to the magnificent preservation conditions and the fantastic rock art. I enjoy working with ASWT for several reasons. I am excited about continuing to work with pioneering digital photogrammetric techniques. I enjoy working with the celebrity guest archaeologists Dr. Black brings out on a regular basis. Finally, I am excited to see what we uncover! Besides the archaeology I am looking forward to working with the great folks from SHUMLA and the Skiles family. I am also curious to see what kind of critters we rustle up this year. If you know Dr. Black, then you know it ain’t archaeology without a snake story!